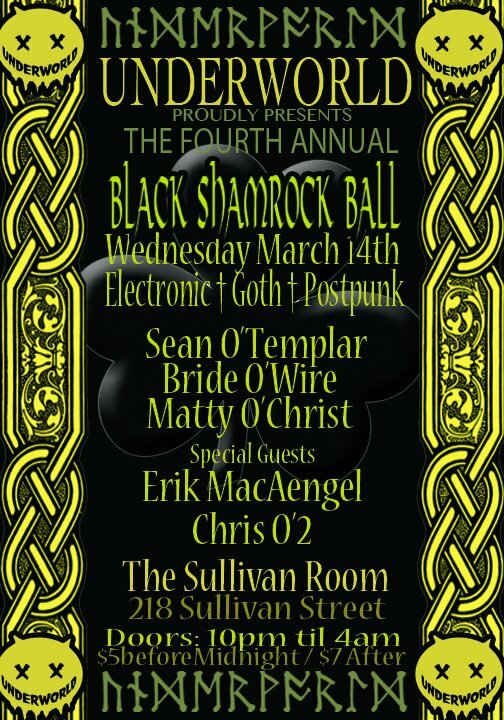 03/14/12 – UNDERWORLD: The Black Shamrock Ball IV ! UNDERWORLD: The Black Shamrock Ball IV ! The Fourth Annual Black Shamrock Ball ! Spinning Goth, Synthpop, Postpunk, Ebm, Irish! tickets to the 3/17 STIMULATE St. Patrick's Day "Green Theme"
Always Remember Quality over Cruelty! :Bride of Wire, D Chris #2, DJ Aengel, DJ Templar, Goth, Industrial, leprechaun, Shamrock, St. Patricks Day, V-Christ, Xris SMack!